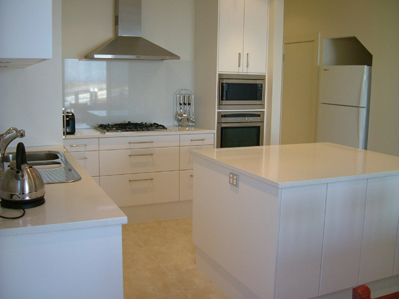 30 Marina Drive, Pt Vincent Marina, South Australia, 5581. A two hour drive from Adelaide. Experience the luxury of mooring a boat at the front door step of this exclusive modern waterfront residence and catching fish from your private pontoon. Then relax and enjoy magnificent marina and sea views from the ground floor kitchen, dining and lounge areas, two upper bedrooms, private balcony or from the warmth of the 2-person spa bath. You have the choice of booking the entire Marina Apartment or just a proportion of it namely: just the ground floor with access to one bedroom and one bathroom as well as the kitchen, lounge, dining areas and laundry room. Or perhaps for a romantic occasion you would prefer the upstairs bedroom with its private balcony and ensuite bathroom that offers the 2-person spa bath. The desired bedroom combination is your choice. The Marina Apartment is positioned on the new Vincent Landing Marina, which is a short walk to South Australia’s popular coastal holiday seaside town Port Vincent. 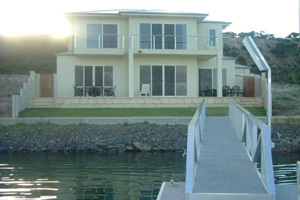 Situated on the East coast of the Yorke Peninsula. Close to shops, café, towns facilities, hotel, scenic walking trails, new boat ramp and central to Yorke Peninsulas main attractions. Ground floor bathroom with walk-in shower and adjustable rail, toilet, vanity and hair dryer. Please note: No-smoking permitted inside apartment, smoking outside only. No pets allowed. Young children are to be supervised at all times whilst outside. Our aim is to listen to your individual personalised accommodation requirements and tailor a package to suit you. Rates are based upon: length of stay and season. If paying the balance at time of arrival, no cheques will be accepted and credit card details will need to be phoned through to Anita McDonald on her mobile number (0411 102773) prior to collection of keys. An additional $100.00 bond will be taken at time of booking. Provided the keys are returned and the apartment is left in an appropriate condition, the bond will be returned via mail by cheque. Check in time and pick up of keys is to be arranged at time of booking or prior to arrival day. Kindly check-out no later than 10:30 am on your date of departure, unless otherwise arranged. Please remember to leave keys inside apartment unless otherwise arranged. Monies paid unless we are able to rebook your entire stay to another group at full tariff.